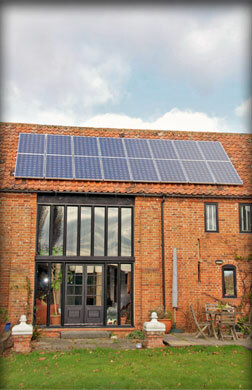 Looking for Solar PV Photovoltaics in North Walsham, Norfolk and East Anglia? With energy costs constantly soaring, more people are discovering the benefits of generating their own electricity! Solar Panel Photovoltaic (PV) technology has come a long way, and modern installations can provide enough electricity to power home lighting, appliances or even heating systems. What’s more, you can sell excess energy back to the National Grid, meaning energy companies pay you! Efficiency depends upon the location, shading and number of panels used. Planning Permission is not usually required, but if you live in a listed building or conservation area, it may be worth getting advice from your Local Authority.